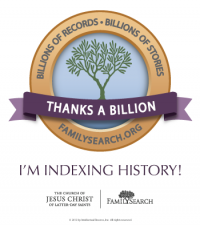 This is entry #26 in Amy Johnson Crow’s Challenge: 52 Ancestors in 52 Weeks. It’s hard to believe the first half of this wonderful challenge is ending this week. Note: As of 13 January 2019, this post has been updated with sources and images. This is my Last Will and testimony wherein I do wish to will my Land to Mary Doss and her Children John William Doss, Alexander Doss, Loving Ann Doss, Elizabeth Jane Doss, Thomas Eli Doss, Joel Doss and Charles Henry Doss and my wish is that the said Mary Doss and her said heirs shall hold the percession of said Land and to work it at their option untill the said Mary Dosses Death and then to be Equally Divided between said Children and that the said Land shall not be transfered out of the family if it is that the said transfer shall not stand and I do will Mariah Jane Petterson three Dollars and I do will John William Doss one horse and Alexander Doss one young mare and Loving Ann one 2 year old Colt and my tools and implements stay on the farm of all kinds to stay on the farm for the use of the family and I have made this my will and do acknowledge the same to be my volunter act and have this the day above written caused my name to be written and have fixed my mark and seal to be made. in addition to the foregoing will it is my will that Thomas Doss Has My Big Gun. Mary E. DOSS and William CLONCH were never married and the children mentioned are “theirs.” The five boys and Elizabeth Jane used the CLONCH surname following William’s death. Only “Loving Ann” used the DOSS surname when she married a year later in 1863. I believe there is a reason why William and Mary never married. The reason being Ann Eliza HILL, the woman he married in 1832. She was the mother of Mariah Jane mentioned in the will. This is a complicated story which I will get to as we go back in time. After drawing up his will, William CLONCH died three days later on 20 January 1863 in Mason County, (West) Virginia, of typhoid fever. His occupation was listed as a gunsmith. The informant was Mary CLONCH, his widow. His widow? They lived together for over 20 years and had 8 children together, does this make her his widow? Was this Mary CLONCH the same person as Mary E. DOSS seen in his will? I would say yes as she was seen with him in the 1860 census as Mary CLONCH and in the 1850 census as Polly DOSS. At a Court held for the County of Mason at the courthouse therof on Monday the 2nd day of March 1863. 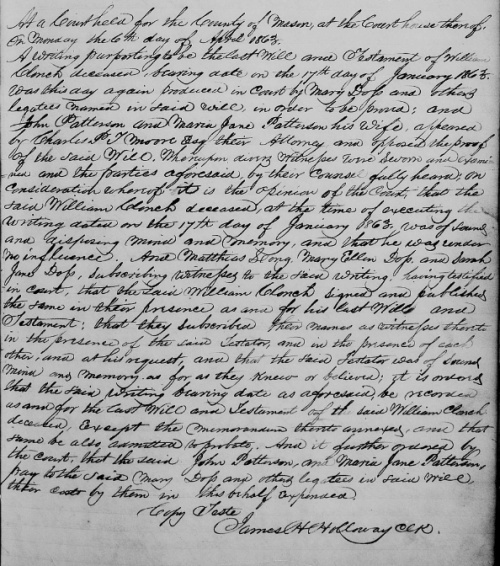 A writing purporting to be the last Will and testament of William Clonch deceased, was this day produced in Court and proven by the oaths of Matthias Long, Mary Ellen Doss, and Sarah Jane Doss, the subscribing Witnesses thereto, who made oath that said writing was signed and acknowledged by the said William Clonch by his marking his mark thereto, and at the same time acknowledging the same as and for his last Will and Testament in their presence and at his request and in his presence and in the presence of each other, they signed their names as witnesses thereto, and that the said Testator was of sound mind and disposing memory to the best of their knowledge, and belief. Whereupon it is ordered that said writing be recorded and admitted to probate, as and for the last Will and Testament of the said William Clonch decd. Copy Teste James H. Holloway Clk. John Patterson and Maria Jane Pattersons Children and heirs at law of William Clonch deceased having come into court after the application had been made to Submit a certain writing purporting to be the last Will and testament of said Clonch to probate moved the court to recind their Judgement on said Application. And thereupon the Court having condisered thereof doth reconsider the same, and doth continue the further hearing of the same to the next term of this court. At a court held for the County of Mason, at the Courthouse thereof on Monday the 6th day of April 1863. A writing purporting to be the last Will and Testament of William Clonch deceased, bearing date on the 17th day of January 1863 was this day again produced in Court by Mary Doss and other legatees named in said will, in order to be proved: and John Patterson and Maria Jane Patterson his wife appeared by Charles P. T. Moore Esq. their Attorney and opposed the proof of the said Will. Whereupon divers Witnesses were sworn and examined and the parties aforesaid, by their counsel fully hears; on consideration whereof it is the opinion of the court, that the said William Clonch deceased, at the time of executing the writing dated on the 17th day of January 1863 was of sound and disposing Mind and Memory, and that he was under no influence, And Matthias Long, Mary Ellen Doss, and Sarah Jane Doss, subscribing witnesses to the said writing, having testified in court, that the said William Clonch signed and published the same in their presence as and for his last Will and Testament, that they subscribe their names as witnesses thereto in the presence of the said Testador, and in the presence of each other, and at his request, and that the said Testador was of sound mind and memory as far as they knew or believed; it is ordered that the said writing bearing date as aforesaid, be recorded as and for the last Will and Testament of the said William Clonch, deceased, Except the memorandum thereto annexed, and that same be also admitted to probate. And it further ordered by the court, that the said John Patterson, and Maria Janes Patterson, pay to the said Mary Doss and other legatees in said Will their costs by them in this behalf expensed. John and Mariah Jane PATTERSON were ordered to pay the expenses of Mary DOSS and the other legatees in the will. Did Mariah Jane’s $3 inheritance cover the costs? 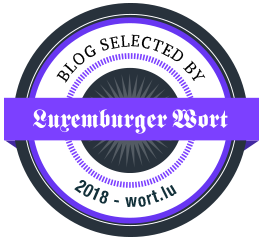 UPDATE: add the link to post when it is published! With his last will and testament out of the way, I can continue back through the years and hopefully answer some of the questions about the relationship William CLONCH had with Mary DOSS. William was last seen in the 1860 census5, his surname spelled CLAUNCH, with his “wife” Mary and their children John W., Alex, Luvina, Elizabeth, Thos. E., Joel, and Charles H. Also in his household was John W. CLARK age 64. Unfortunately prior to 1880 the relationship to a head of household was not noted on the census. In 1850 William CLONCH is seen with Polly DOSS and four DOSS children.6 Three of these are the same as seen in 1860 but with the CLAUNCH name. The fourth DOSS child, Jeremiah age 2, is believed to have died before the 1860 census as he is not listed in that census or mentioned in the will. Jeremiah was the name of William’s grandfather. Lavina Ann and Jeremiah never used the CLONCH or CLAUNCH surnames. In 1945 Lavina, the last surviving child of William CLONCH, died. The informant on her death certificate did not know who her father was. Polly DOSS was listed as the mother. Her relatives boasted that she was 109 years old when she died. Her age on her death certificate was 106 yrs 4 mos 18 days. 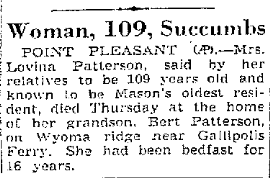 She was actually 10 years younger than the age in this clipping7 — but still nearly 100! My 3rd great-grandfather William CLONCH was the son of Dennis CLONCH and Nancy BEASLEY. They were married on 8 November 1803 in Mecklenburg County, Virginia. They moved to Kanawha County, Virginia [now West Virginia], about 1806 as Dennis was on the tax lists of Mecklenburg County in 1805 and of Kanawha County in 1806 and 1809. He was on the 1810 Kanawha County census with his wife and three children: William and his older sister Elizabeth and another female who remains unidentified. Dennis died during the 1810s as his wife Nancy was the head of household in 1820 through 1840 in Mason County. Sib 1: [–?–] CLONCH, born bet. 1805-1809 in Kanawha County. This sister remains unidentified. Sib 2: Elizabeth CLONCH, born bet. 1805-1809 in Kanawha County. She married Meridith PARSONS (1805- ) on 26 February 1825 in Mason County, (West) Virginia. She died before 1840. William CLONCH was born about 1807 in Kanawha County. Sib 3: John CLONCH was born about 1810 in Kanawha County. He married Elizabeth DOSS (1817-1880) on 15 September 1842 in Gallia County, Ohio. He died between 1844-1847 most likely in Mason County. Sib 4: Sarah CLONCH was born about 1811 in Kanawha County. She married William WILLIAMS (1808-1850s) on 4 January 1832 in Mason County. After his death and before 1860 she married James William GALLIWAY (1832-1880). By 1840 William and Ann Eliza were living in separate households in two states. William did not have children in his 1850 household who would be old enough to also be seen in 1840. So what are we seeing in these listings? Apparently, William and Ann Eliza broke up and William took Mariah Jane who was born about the time that her parents married. 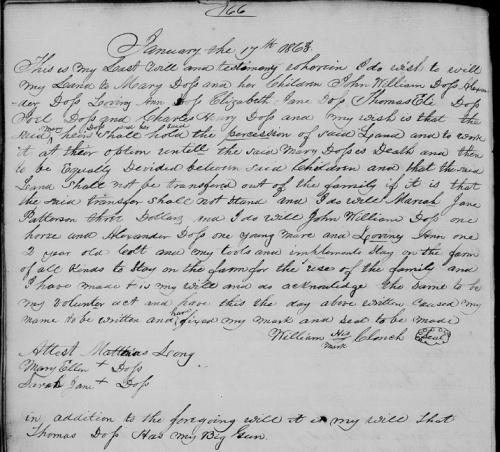 Mary E. DOSS may be the woman living in William’s household as she would be giving birth to their first child John William CLONCH in December 1840. But who are the young boys seen with “Eliza CLAUNCH” in Gallia County? When researching our family history we never know what bones we may dig up that might have best been kept buried. This lady intrigued me enough to search further. As far as I could tell most CLONCH researchers believed that Ann Eliza HILL died or divorced William CLONCH however no record of divorce was found. Could this be a coincidence or was this the same lady who married William in 1832? Ann Eliza HILL’s husband William CLAUNCH (later seen as CLONCH) did not die between the time of the 1840 census and her remarriage on 26 March 1842. Why did she give this false statement? 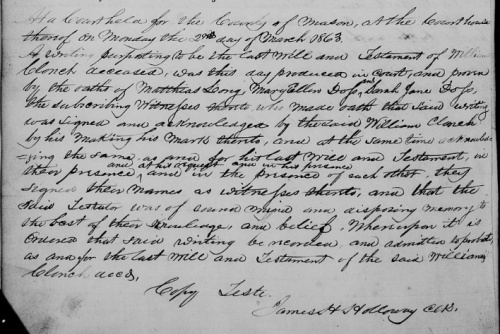 When William made his will in 1862 he mentioned only his daughter Mariah Jane from his marriage to Ms. HILL – no sons! Mariah Jane CLONCH (1831-1863) born bet. 1831-1833 in Mason County, (West) Virginia, married John PATTERSON (1814-1863) during the year before the 1850 census. Mariah Jane and her husband John were last seen in April 1863 when her father’s will was recorded in court and they were ordered to pay expenses. They have not been located in the 1870 census. Four of their five children and one child from John’s previous marriage were located. It has been assumed that Mariah Jane and John died bet. 1863-1870. What about the boys seen with Ann Eliza in the 1840 census? Since the pre-1850 censuses name only the head of household, we cannot be sure that the boys were even related to Ann Eliza. But what if they were her children? The older boy, or one of about the same age, was found with her in 1850 along with her new husband and younger children. The youngest of the two boys was not with her in 1850. Her story does not end here as I followed her until her death. It will be saved for another day. In 1850 John W. CLARK, who was seen with the William CLONCH family in 1860, had his own household.10 In this household were only Nancy CLONCH age 75 and Dennis CLONCH age 12. How is Dennis related to William CLONCH? Could he be Ann Eliza’s younger son? The young boy named Dennis CLONCH seen in the 1850 census appears to be a grandson of Nancy BEASLEY and DENNIS CLONCH. But who was his father? Earlier researchers believed him to be the son of William’s brother John CLONCH. John did not have his own household in 1840 and may have been in his mother’s household. He married in 1842 and died between 1844-1847; his widow remarried in 1847. Since John died before the 1850 census it was believed that Dennis was his son as he was living with Nancy CLONCH. It is my belief that Dennis was the son of Ann Eliza HILL and may not have been acknowledged by her husband William CLONCH as his. Was Dennis the result of an extramarital relationship that caused the breakup of their marriage? Dennis (1838-1893) was born 8 March 1838 in (West) Virginia. Dennis CLONCH married Mary Ann BAKER (1842-1920) on 16 Nov 1858 in Gallia County, Ohio. They had a son named John William CLONCH born on 19 March 1860 and died on 9 February 1861. The first name given to the child may have been what caused an earlier researcher to assume that he was the son of John. Dennis began using the HILL surname on 21 February 1862 when he enlisted in the Union Regular Army at Gallipolis, Ohio. Neither Dennis CLONCH nor Dennis HILL was mentioned in the will of William CLONCH in 1863. He moved to Missouri about 1871 and died in Miami, Saline County, Missouri on 31 July 1893. A Little “Peyton Place” (Part I) and A Little “Peyton Place (Part II). I thought this would be an easy write-up. Writing in chronological order didn’t work as I kept getting hung up on the wife’s part in the story. But the wife was not my ancestor. I wanted Polly to have a larger part in William’s story than his wife had. How did I do? Mary E. “Polly” DOSS, my 3rd great-grandmother, will be the star of next week’s 52 Ancestors installment. Thank you Helen! I always thought my family tree was so “normal” until I got to the families in Mason County WV. I look forward to each new story of mystery, history and family that you put together so well. Thanks for sharing your well researched information. Robert, I wouldn’t have been able to do the ROOP and CLONCH stories without your help. Your getting in touch with earlier researchers and forwarding the information to me was a great help. I can’t believe it’s been 14 years since we started. Remember the excitement? My maiden name is Clonch. I came across this story helping my daughter do an ancestry project for school. My fathers name is Dale Clonch, his fathers name is Robert clonch, his fathers name is George Clonch, his father was Thomas Elias Clonch and his father was William Clonch. Hello Amy! I’m so glad that my blog has been helpful in a school project. I hope she gets an A+ on it!! I only have your father’s name from his mother’s obituary. No further info. If you want to share please send me an email.